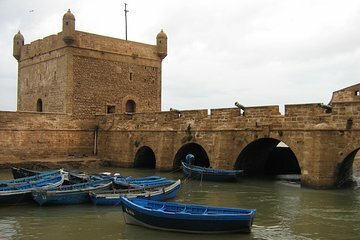 Discover the historical port town of Essaouira as you wish on this private day trip from Marrakech. Travel to the Atlantic coast by private, air-conditioned vehicle, and choose to visit an argan oil co-operative on route. Then, explore Essaouira independently, with ample time to enjoy the blue-and-white medina, ramparts, quaysides, seafood restaurants, and artisanal shops at your own pace. Transport and hotel pickup and drop-off included, with activities in Essaouira at your own expense.